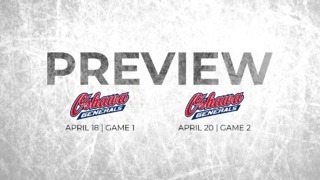 Despite scoring first and sticking with the first-place Hamilton Bulldogs from the drop of the puck, the Ottawa 67’s suffered a blow in their OHL quarterfinal series, dropping Game 4 5-2 to the Bulldogs. The loss puts the 67’s on the brink of elimination, down 3-1 in the series headed back to Hamilton Friday night. 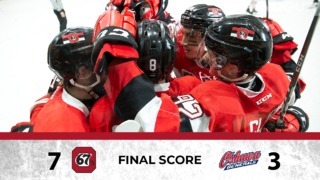 The 67’s did open the scoring in the contest, with one-half of the Bitten brothers breaking the goose egg for Ottawa. Sam continued his impressive play in the playoffs, scoring his third of the postseason to make it 1-0 Ottawa on an early power play. In each of the first four games of this series, the scoring has been opened by either Sam (Games 1 and 4) or Will Bitten (Games 2 and 3). At one point in the opening frame, Ottawa led the shot count 8-1. But that was followed up four unanswered by the Bulldogs, beginning at 12:37 of the first frame. They got offence from different places, as Nicolas Mattinen (2), Brandon Saigeon, and Robert Thomas all had markers by the game’s halfway mark. Ottawa’s coaching staff elected to place Cedrick Andrée between the pipes after the fourth Hamilton goal, and the 67’s responded with a goal of their own. A sweet stretch pass off the stick of Mitchell Hoelscher found Tye Felhaber, who deked his way past Kaden Fulcher for his first goal of the playoffs at 10:28 of the second. That would be as close as the 67’s could make it and a third-period Bulldogs goal would give them a three-goal victory and a 3-1 series lead. 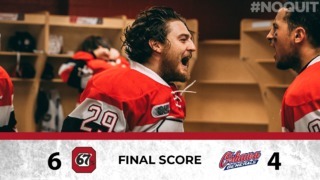 The resilient Ottawa 67’s will now play must-win hockey the rest of the series with the crucial Game 5 set for Friday night in Hamilton at 7 p.m. A win will send the series back to The Arena at TD Place on Sunday, April 1 at 2 p.m.
After scoring seven goals in the regular season, Sam Bitten has almost halved that total in just four postseason games. He has three playoff goals for the Barber Poles. Sam’s older brother and Gloucester native Will Bitten has six points, narrowly outscoring Sam in the series thus far. Travis Barron was the 67’s best faceoff man of the evening, winning 13 draws in 20 attempts. Hamilton’s Brandon Saigeon has been a thorn in the side of the 67’s all series, scoring six goals in four games. Last time the 67’s trailed 3-1 in a playoff series, they were victorious in decisive fashion. They defeated the Mississauga Steelheads 5-3 on March 31, 2017, extending that quarterfinal series to a Game 6 in Ottawa.